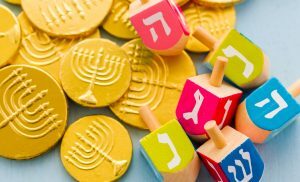 Join Lafayette Village and Chabad Center of Raleigh for our Grand Menorah Lighting and Gelt Drop on Sunday Dec 2nd, 2019! A still life composed of elements of the Jewish Chanukah/Hanukkah festival. Featuring Winterpest Farm Petting Zoo & Live music by Top Notch Entertainment. Donuts & Hot Drinks provided by Chabad Center of Raleigh.